The Nissan One To One Rewards program is a loyalty program designed for YOU to earn valuable points at your Nissan dealership. You earn points based on every dollar you spend at your participating Nissan dealership. You can then redeem those points on your next service visit, for parts or accessories purchases, or, if you choose, for your next new or used vehicle purchased at your Nissan dealership*. Rewards+Plus gives you even more opportunities to earn points by shopping online with over 300 leading retailers. This exciting feature allows you to shop online and each purchase earns you bonus points that can be used exclusively at your Nissan dealership. Select retailers also offer exclusive retail discounts and coupons up to 35% off! Start earning rewards today! Simply log in above with your Nissan One To One Rewards account. If you are not yet a member, just visit a participating Nissan dealership to enroll! Transactions credits will be posted within 30 days of the qualified transaction date. 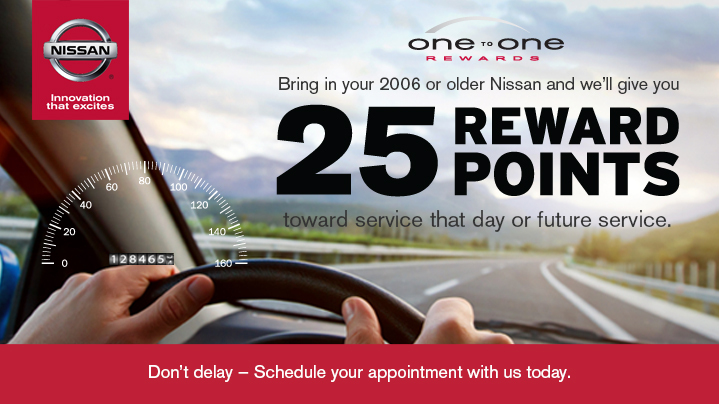 One-to-One Rewards is available to all Ken Ganley Nissan of Medina's customers who are over the age of 18. Fleet or wholesale customers are not eligible to participate in the program. Participation in the program constitutes each One-to-One Reward owner's full and unconditional agreement to these Terms and Conditions. Incentive points have no cash value and cannot be redeemed for cash. Any items purchased through the rewards program can not be returned for cash. All returned items point values will be returned applied to the originating One-to-One card. No exceptions. Award points will expire within 24 months of inactivity. One-to-One redemption cannot be combined with any other discount or offer. Ken Ganley Nissan of Medina holds the sole right to determine redemption eligibility. One-to-One rewards cards can be used for any Nissan vehicle within the holder's household as determined by owner's address. One-to-One reward points can only be earned on retail purchases and not earned on warranty repairs or goodwill. Qualified retail purchases include: parts, detail, services, maintenance and accessories. One-to-One reward points cannot be earned on new or used vehicle purchases. Each of the points earned is equal to one dollar in awards discounts. One-to-One reward points cannot be earned on new or used vehicle purchases, body shop services, wholesale parts purchases, warranty, insurance or extended warranty purchases. Members must present valid membership card at time of purchase in order to accumulate points. Membership and points may not be transferred from account to account. At no time can members pool accumulated points. Membership and points can not be sold, bartered, brokered or transferred for any reason including death and domestic matters. Membership and points have no cash value. Qualifying New & Certified Ken Ganley Nissan of Medina's vehicle purchase earns a one-time $250 toward a future New or Certified Ken Ganley Nissan of Medina vehicle purchase. Each retail service event (parts and labor) earns 3% of the total dollars spent (less tax) towards a future service, parts or accessory sale. Each parts and/or accessory purchase earns 3% of total dollars spent (less tax) towards a future service, parts or accessory sale. The following document details the terms and conditions of Ken Ganley Nissan of Medina's One-to-One Rewards Program. Upon receipt of the Ken Ganley Nissan of Medina's One-to-One Rewards Program membership cards, member agrees to be bound by the program rules, terms and conditions. Ken Ganley Nissan of Medina's One-to-One Rewards members will receive incentive points every time they 'swipe' their card for every dollar spent on parts and services and up to a specified amount towards the purchase of a New or Certified Nissan vehicle at Ken Ganley Nissan of Medina's. These points are only redeemable at Ken Ganley Nissan of Medina and not at any other Automotive Group franchise or Nissan dealership. This membership is at no cost to the consumer. Simply swipe your card at our cashier when you pick up your vehicle, and we'll take care of the rest. With every dollar you spend in our service department, we will apply a percentage of your total bill pre-tax to the preferred card in the form of award points. We are a full-service maintenance and repair center. As an authorized Nissan dealer, our customers are assured of the availability of genuine Nissan parts for all vehicle maintenance and repair needs. We have the right to change the rules and/or terms or cancel the program at any time without notice.